Over the past two years, I have met brilliant Muslim women from all walks of life thanks to the Muslim Girl family. Although we interact virtually, every writer, editor, artist or poet shines through her unique persona, marvelous achievements and zealous attitude. But Aya Khalil stands out from the crowd. Not only is she an extraordinary educator, journalist, activist, community advocate and mother, but she is also an amazing ally, always cheering her friends on. I haven’t met her yet in the real world, but I can see the beauty of her soul reflected in her dark green eyes and gorgeous smile. Okay, I stalk her on Instagram! So what? I love this girl’s energy! Today, I am honored to introduce you to Aya Khalil, our #MuslimGirlBaddie of the month who recently published her 100th article for MuslimGirl. Please take a few moments to get to know her, read her work, and learn about all the amazing things she is doing in her community. MuslimGirl: Can you tell your readers about Aya Khalil? Who is she? Where does she come from? Education, occupation? What does she like/dislike? What makes her laugh/cry? Favorite quotes and cherished memories? Kids, family, school, and hobbies? Aya Khalil: I’m an Egyptian-American journalist and educator. I teach Arabic at a local Montessori school. I hold a master’s degree in Education and a BA in communication and English literature. I like sushi, taking naps and coffee. I also have two active little ones. I live in Ohio and have lived in six other states. I love to travel and learn about different cultures and trying new food. I’m also a community organizer and I help plan kids storytimes, community services and converts/interfaith events and workshops at our local masjid. 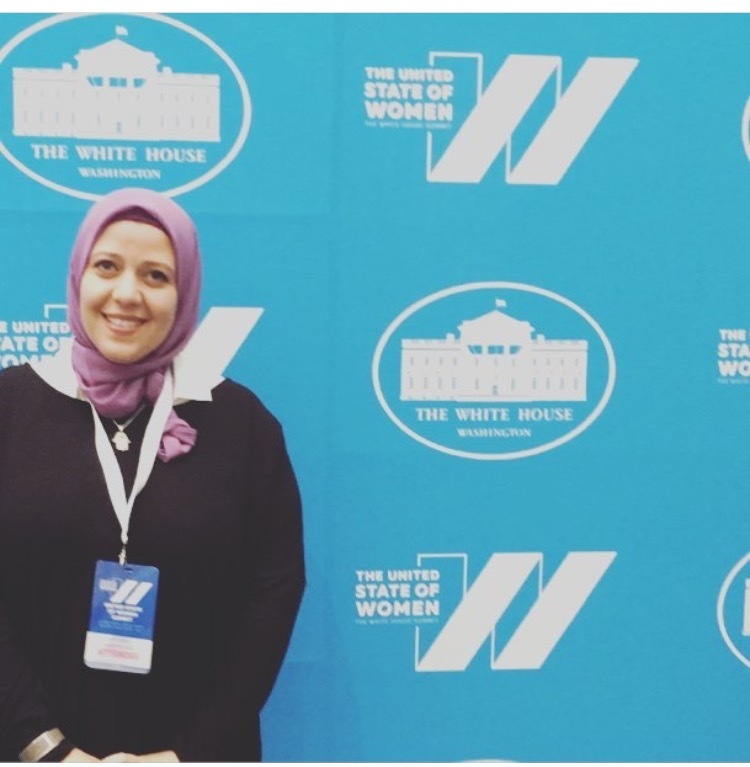 One of my most cherished moments was last year when I was invited to attend the White House’s United States of Women convention with other Muslim Girl writers and editors. It was such a blessing and so much fun. You’re the Queen of Listicles. Tell us about how you develop your ideas for each one and what makes you super duper in developing them? Do you have a favorite listicle? I love listicles! I love reading listicles because they’re fun, informative and short. I guess I just like to think of what I would like to read about in a listicle and go from there. I love listicles related to children, education, Muslim women. You’re published in the Huffington Post, the Christian Science Monitor, Patheos, and MuslimGirl. Can you tell your readers more about your work and what motivates you to write with such passion? Years ago when I graduated from journalism school, there were only a handful of Muslim women journalists that I knew of (like Mariam Sobh whom I looked up to). Nowadays, there’s so many, and I am so grateful for that! I enjoy writing thought pieces from the heart, so I will usually find something I am passionate about and use personal anecdotes as well as facts. I love writing listicles, of course, especially when they’re informative as well (such as books, gift ideas, or who to follow on social media, etc). You’re a mother to two gorgeous kids (masha’Allah) Muhammad and Aminah. How do you juggle being a teacher, mother, writer, advocate and activist while being so badass and awesome? Oh wow, that means so much coming from you! Right now, my children are fighting over fruit snacks and I am sitting here answering these questions! Being a mother is definitely challenging. I always try to find “me” time at least a couple of times a week, whether that’s taking a cardio drumming class at the gym, meeting a friend for coffee or treating myself to a facial. I have a very supportive family and husband so that is definitely important — a support system, whether family, friends, neighbors or your local masjid. I also try to think of what my kids would like and expand on that. for example, a couple of months ago my friends and I started weekly story times at our local masjid where we read an Islamic-related book, do activities and have guest speakers. We also started a Ramadan Kids Club last year and this year we got all the kids (about 50 kids ages 3-5 who registered) bake goodies for the local fire station and we hand delivered them. We also made dinner to families at the Ronald McDonald House. These activities are all learning experiences for the children as well as serving our local community. The earlier to teach the kids these lessons, the better. With all your amazing accomplishments, what is one thing you would still like to achieve and why? Publish a children’s book! I have so many ideas but I just need to finish the whole process. As an educator and mother, I’m always on the hunt for good, quality, children’s books that promote dialogic reading. If a publisher is reading this and is interested in publishing diverse, multi-cultural children’s book, let’s connect! Lastly, what advice do you have for Muslim girls out there who are struggling in today’s charged political and social climates? Stay strong, trust in Allah (SWT), and follow your passion. If you want a badass friend-ally, wish to read thought provoking pieces and listicles, or want creative ideas for community organizing, Aya is your go-to Muslim girl! May you continue to inspire people and touch their lives the way you did mine. 10 Years of MuslimGirl.com: Where Are They Now?